New Zealand Prime Minister Jacinda Ardern has made her debut speech at the UN in New York - and in another first for the organisation she brought her baby along too. Ms Ardern played with daughter Neve Te Aroha on Monday, shortly before addressing the UN's General Assembly. Her partner Clarke Gayford, Neve's primary carer, held New Zealand's "first baby" while she spoke. Mr Ardern is only the second elected leader to give birth while in office. She made her debut speech at the Nelson Mandela Peace Summit, where she highlighted the former South African leader's "profound impact" on her country. The New Zealand premier is currently breastfeeding three-month-old Neve, meaning "it was a very practical decision" to bring the infant on the six-day international trip. "Neve is actually nearby me most of the time in New Zealand," Ms Ardern said according to NZ's NewsHub. 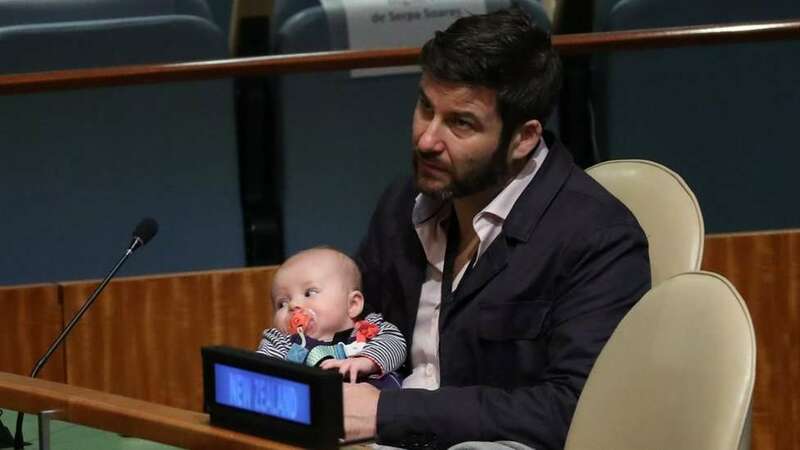 While the the prime minister attends UN meetings, Mr Gayford will take the lead in caring for the First Baby, as a UN ID card playfully described the infant. The PM told the New Zealand Herald she would bear the cost of her partner's travel, as "he's primarily travelling to care for Neve". Ms Ardern returned to work in early August after spending "the fastest six weeks" of her life on maternity leave. "Prime Minister Ardern is showing that no one is better qualified to represent her country than a working mother, UN spokesman Stephane Dujarric told Reuters. "Just 5 per cent of the world's leaders are women, so we need to make them as welcome here as possible," he added.